A-Ret Gel is a perfect choice for clearing up acne, pimples, and other impurities from the skin. No other topical formulation can work better than removing acne, acne scars, and sun damaged skin. Once your skin starts clearing up, you become more confident. A-Ret Gel not only works to heal your acne but also stops the formation and dividing of acne. The regular use of the product prevents whiteheads and blackheads that turn into pimples. Apart from this, many people use it as an anti-aging formulation to clear up the aging signs and spots. 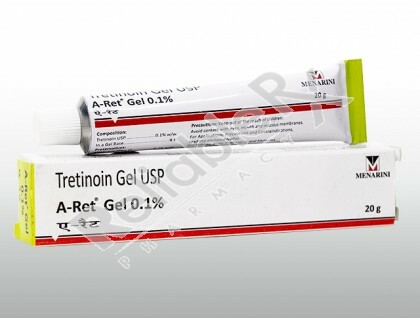 Tretinoin is the main generic drug present in the brand A ret gel. The active ingredient of the medicine Tretinoin is placed in the category of keratolytic drug that changes the working of cells and reduces the appearance of dark spots, fines lines, acne scars, and of course acne. The medication also removes the hardness of the outer layer of the skin and boosts the turnover of the skin, fades acne, blackheads, and whiteheads, as well as a decrease in the spread of acne. Tretinoin promotes new skin cells production that gives smoother and glowing skin. Acne and unwanted spots may be upsetting or terrifying. These skin conditions give rise to the feeling of low self-esteem, anxiety, depression, the worry of poor external appearance and these situations led you reach for an ideal option that can alleviate these skin issues permanently. Don’t waste your time and resources in searching as we present A ret gel that is the most effective treatment for acne and pimples. Apply the formulation on the clean and dry skin. Do not forget to wash the application site with warm water and a mild cleanser. It is necessary that your affected area is completely dry before applying the cream, so wait for at least 10 to 15 minutes after washing the skin. Also, make sure that you wash your hands before and after using tretinoin cream. Avoid getting the formulation in your nose, eye, mouth and even broken skin. Rinse with plenty of water if you do by mistake. Apply the cream once daily, preferably at bedtime. So not change the dosage plan unless instructed by your physician. Tretinoin is more like a form of naturally derived vitamin A. It was used for the acne treatment previously, but later on, it was found to be an excellent anti-aging agent. This active ingredient is available in different skin care products like Retin-A, Retin-A Micro, and Renova. Dermatologists widely recommend tretinoin cream to diminish the intensity of acne breakout. Those who want to treat acne and pimple marks on the skin can use this cream but under prescription.